One of my favorite homeless stories, “The Broken Dream Factory,” which was something of a breakthrough story for me, has finally found the perfect home. I just got word that marvelous zine Lady Churchill’s Rosebud Wristlet will be publishing it. Edited by Kelly Link and Gavin Grant, LCRW is definitely worth checking out, and I’ll be honored and pleased to appear in its pages. Where have I been? I had surgery on Monday, a radical prostatectomy for cancer diagnosed in April. Yeah, I’ve had a lot on my mind. The surgery, performed by Dr. William R. Morgan, went textbook perfect, and I’m recovering nicely at home after spending two nights at St. Mary’s Hospital in Richmond. I’m sure some character in a future novel will get to sport a catheter for a while, a most interesting device… The nurses were absolutely fantasticâ€”Sue, Vernon, Rhonda, Kamari, and Shawntaâ€”angels all. I can’t say enough about the excellent, compassionate care I received. Thank you, thank you, thank you! 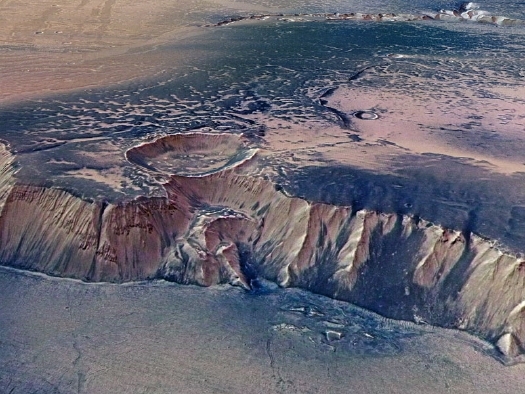 With a four-kilometer drop, this high cliff surrounding Echus Chasma, near an impressive impact crater, was carved by either water or lava. A leading hypothesis is that Echus Chasma, at 100-kilometers long and 10-kilometers wide, was once one of the largest water sources on Mars. If true, water once held in Echus Chasma likely ran over the Martian surface to carve the impressive Kasei Valles, which extends over 3,000 kilometers to the north. Even if initially carved by water, lava appears to have later flowed in the valley, leaving an extraordinarily smooth floor. The above image was taken by the robotic Mars Express spacecraft currently orbiting Mars.